A MAN WITH GREAT PASSION FOR SOULS. Bishop Prince Nnams and his wife,Rev. Deborah Ugoeze, founded The Great Achievers International Churches(A.k.a. Victory Temple Assembly) (GAIC-VT) in March 2002. At that time, GAIC was simply a small group of friends and family learning and growing in the Lord in the living room of the Founder’ s home. In the years that have followed, GAIC has become a fast growing non-denominational, multi-cultural church. Bishop Nnams is well known in many circles not simply because of his honest, on-point, and lively speaking style, but because of his compassion and deep love of family and community. He is especially passionate about the youth and ensuring that today’s children understand love: the love of God, the love of their parents, and the love of self and community. Bishop Nnams is a member of numerous organizations including: Penticostal fellowship Of Nigeria, African Evangelical Ministers Association-Spain,UK WORLD EVANGELISM TRUST-LONDON, Assemblies of God Church-Nigeria. Apostle Dr. Prince Nnams Nmecha is a dynamic missionary evangelist from Nigeria, Africa. He preaches with signs and wonders following. His preaching inspires Christians to be militant and aggressive in these end times. Apostle Dr. Prince Nnams N.Kalu is the founder/presiding Bishop of The Great Achievers International Churches and Ministries World-Wide.President of Prince Nnams World Evangelism , a highly formidable Evangelistic and Missionary Network Team with over 250 members. They are involed in church planting and the establishment of campus ministries and youth Fellowships. They conduct crusades, revivals, missionary and evangelism seminars also Marriage seminars. Apostle Dr. Prince Nnams Nmecha Kalu is a respected Christian Leader in Africa and Europe. He is a man of solid Character and integrity, He was born,dedicated and baptized in water baptizm in 1978,in ASSEMBLIES OF GOD Church in Nigeria , and called into the ministry in 1988. He travels extensively within Europe, Africa on Evangelistic/ Missionary outreach, intercessions, Spiritual warfare and Building kingdom business people. He is a Multi - talented man of God Tested and Trusted with Prophetic anointing. His ZEAL for the ministry is demonstrated as he travels across the nations preaching the gospel and raising up ministry and evangelism teams for the local churches. His ministry cuts across all denominational barriers. He is specially ordained to carry the Message of Salvation, Delivarance- Healing,Undiluted and Uncompromising end-time word of God, by the Spirit as an Apostle, Evangelist, Pastor with apostolic missionary mandate. In 2002 the Lord spoke to him to create a ministry . 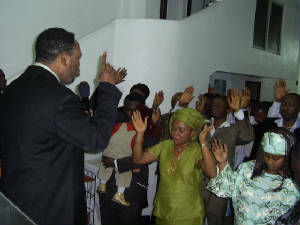 Apostle Prince Nnams N.Kalu started by praying with seven people in his flat( Apartment) in Aba, Abia State, Nigeria. He prayed for God's direction as to what the Lord would have them to do.And God told them to shift their base to europe, Germany to Spain where the Church is currently booming as the fastest growing churches in spain,Philippines and India. The secret behind His effective ministerial activities, Breaking of curses/yokes, Land deliverance is that he works according to the vision and direction God has given to him based on the word of God. Apostle Dr.Prince teaches that breakthrough does not come by accident or by sudden, but with good planning and laying good foundation in God. And success does not come out of much struggles but through, Faithfulness, Truthfulness, Determination, Steadfastness, and Living a Holy Life. Apostle Dr. Prince Nnams Nmecha kalu is a man that hates seeing people suffering. He is not ignorant of God's revelation according to JEREMAIAH 32 : 27 Which says " BEHOLD IAM THE LORD, THE GOD OF ALL FLESH, IS THERE ANYTHING TOO HARD FOR ME" ? A lot of testimonies has been given concerning the miraculous works of God in the lives of both his members of His church and none members alike, Also every word of prophecy the Lord has given him always come to pass as He received it. In addition, through the ministration of Apostle Dr. Prince Nnams Nmecha Kalu, some politicians have rises to greater success and many were saved as they allow God's word rule their lives. People who were in debts have been librated and beggers now run their own Business, Diseases and Sicknesses were miraculously cured, Breast Cancers,Tumors, Kidney infections,H.I.V./AIDS, all sort of incurable maladies disappeared and Demon possessed were Set Free. Sending missionaries to various Communities, States and Nations. Apostle Dr. Prince's VISION is to INCREASE in what he is already doing. Diploma in Cosmetology, Certificate of Nursing training programme,Assemblies of God, Rivers Bible College,Eleme-Port Harcout, An affiliate of Ahamadu Bello University zaria Where He obtained Diploma in Theology, Bachelors of Arts Degree in Missions and Communication,with Vision International College & University, U.S.A. (African Campus). Many honors have been bestowed on Prince Nnams Nmecha, including honorary Doctorate of Divinity and Humanities as a respected spiritual leaders in Africa In recognition of his achievements and contributions to African evangelization. He is married to Rev. (Mrs) Deborah Ugoeze Nnams, the marriage is blessed with four (4) Children. He who has pity on the poor lends to the LORD, and He will pay back what he has given. Whoever shuts his ears to the cry of the poor will also cry himself and not be heard. 15Now you Philippians know also that in the beginning of the gospel, when I departed from Macedonia, no church shared with me concerning giving and receiving but you only. 16For even in Thessalonica you sent aid once and again for my necessities. 17Not that I seek the gift, but I seek the fruit that abounds to your account. 18Indeed I have all and abound. I am full, having received from Epaphroditus the things sent from you, a sweet-smelling aroma, an acceptable sacrifice, well pleasing to God. 19And my God shall supply all your need according to His riches in glory by Christ Jesus. 44"Then they also will answer Him, saying, "Lord, when did we see You hungry or thirsty or a stranger or naked or sick or in prison, and did not minister to You?' 45Then He will answer them, saying, 'Assuredly, I say to you, inasmuch as you did not do it to one of the least of these, you did not do it to Me.' 46And these will go away into everlasting punishment, but the righteous into eternal life." Their throat is an open sepulcher; they flatter with their tongue. discomfited them. He delivered me from my strong enemy, and from them which hated me. For they were too strong for me. For thou hast girded me with strength unto the battle. Thou hast subdued under me those that rose up against me. All nations compassed me about: But in the name of the Lord will I destroy them. To bind their kings with chains, and their nobles with fetters of iron to execute upon them the judgement written: This honour have all His saints. Praise ye the Lord !!! Ps. 149:8,9. From today one man will always be afraid of u, dat man is Failure. Another man has denounced his friendship with u, dat man is Fear. This man Frustration, has vowed never to have anything to do with u again. But these men, Goodness, Mercy,Favour and Wisdom have chosen to follow you anywhere you go & will never leave u. Prayer turns coward into conquerors,chaos into calm,&cries into comfort.The better we know God,the more we will TRUST HIM.The more we Trust HIM,the more we sense HIs PEACE.More blessings.Have a nice day! THE GRACE OF GOD MAKES A MAN FUNCTION WITHOUT STRUGGLE, FAVOUR MAKES A MAN/WOMAN RECEIVE WITHOUT ASKING. THIS WILL NEVER DEPART FROM YOU. YOU'LL BE GRACIOUSLY FAVOURED IN THE NAME OF JESUS I PRAY AMEN, SAY AMEN AND SEE YOUR BLESSING FOLLOWING YOU EVERY DAY OF YOUR LIFE. One quality which characterizes a spiritual person is the great calm he maintains under every circumstance. Whatever may happen around him or however much he may be provoked, he accepts it all calmly and exibits an unmovable nature. He is one who is able to regulate his every feeling, because his emotion has been yielded to the cross and his will and spirit are permeated with the power of the Holy Spirit.